Hello sewing friends! Now is about the time I begin my Halloween costume sewing frenzy. Are you making Halloween costumes this year too? Probably all of you already on top of it, right? 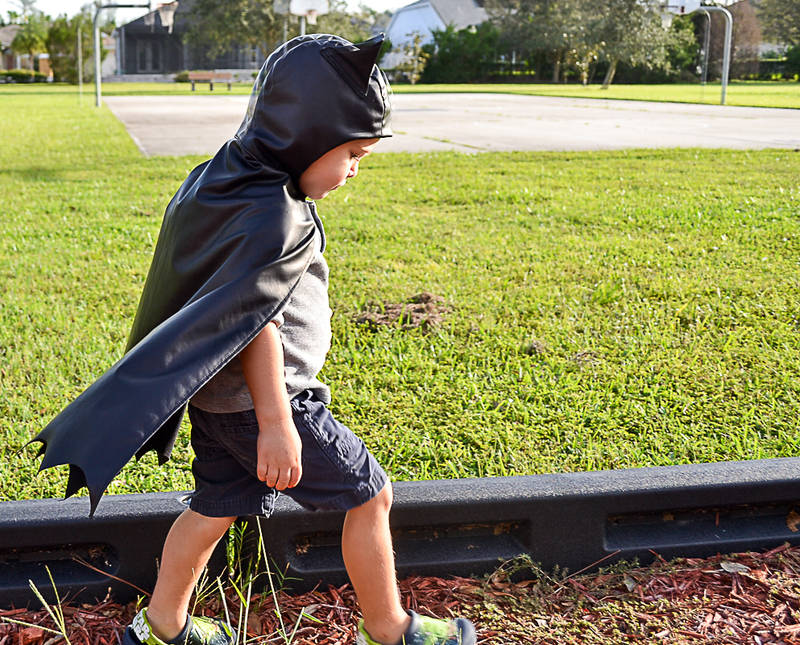 I hope you had a chance to see my DIY Hooded Bat Cape post over on the Fabric.com Blog last week. You totally have time to make this before Halloween! 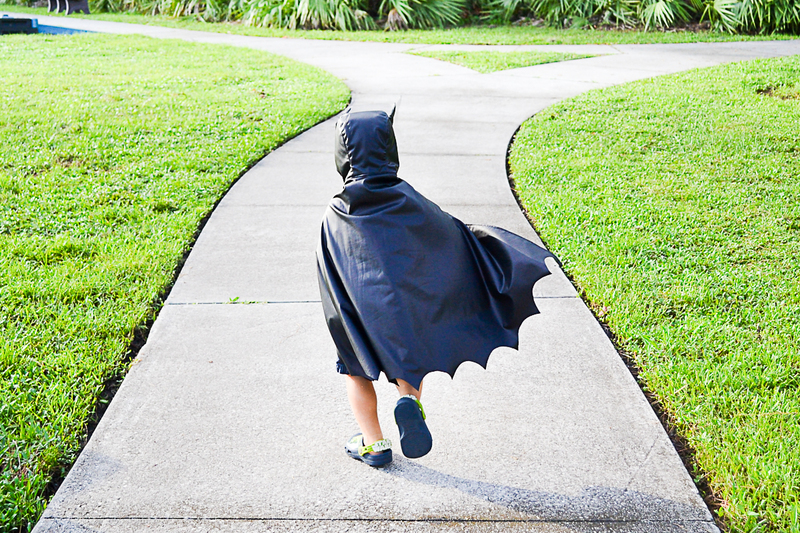 Throw a pair of Batman PJs under it and your costume is ready. I had so much fun remaking this cape. It is a design I made years ago for my first son and it has been a favorite dress up for all my boys through the years. It was getting a little tattered so I thought this littlest boy could use a new one. I love taking a little time to make costumes that are used over and over for dress-up. I'm sure this one will be just as loved as the other one has. Plus, this fabric!! I got to choose from a bunch of knits for this project for Fabric.com. They sent me some samples and I was so excited to find this one. It screams "I'm Batman". Its Polyester/Spandex jersey knit with a matte finish. It has a little sheen to it and it looks like lightweight stretchy vinyl. So Cool! You can also sew this cape with a medium weight 100% Polyester knit or a Scuba knit. They totally work too. 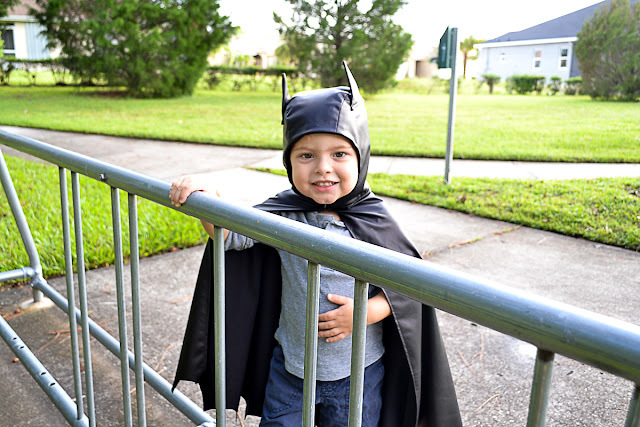 Anyhow, here are a few more photos from when my older boys were younger of ways we turned this simple cape into a full costume using PJs or a simple Batman shirt and belt with yellow felt wrapped around it. This post contains affiliate links. If you purchase something through one of those links I may receive a small commission, so thank you for supporting Blue Susan Makes when you shop! This Like my style? Check out my Blue Susan Etsy Shop where you'll find more beautiful handbags and easy-to-read PDF sewing patterns for sale.